If my 1979 express cruiser could talk, I’m sure we would have an incredible conversation. I’m especially interested in the stories that would explain the smell of cigarettes and cologne in the interior. Although I may be curious about the odors’ origins, I still spent many hours steam cleaning and sanitizing to make them a distant memory. In addition to obsessive cleaning, I replaced the interior carpet. 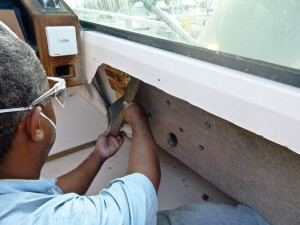 Since most of my recent boat projects have been on the exterior, I decided to apply my acquired carpentry skills to install new carpet on the cockpit sidewalls. 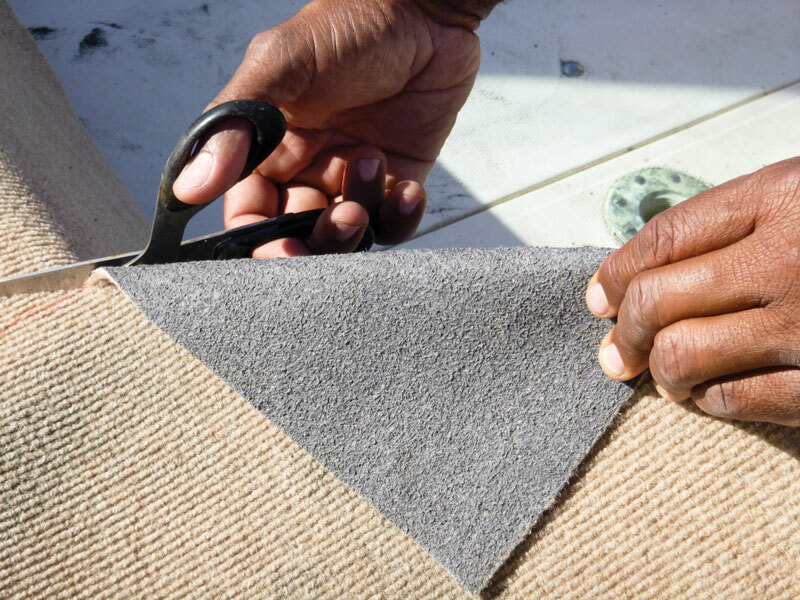 Before you unleash your inner interior designer, make sure you select marine-grade carpet for both interior and exterior applications. 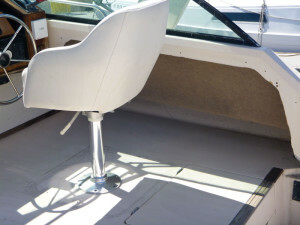 Marine-grade carpet generally repels water and is resistant to mildew, grease and oil. 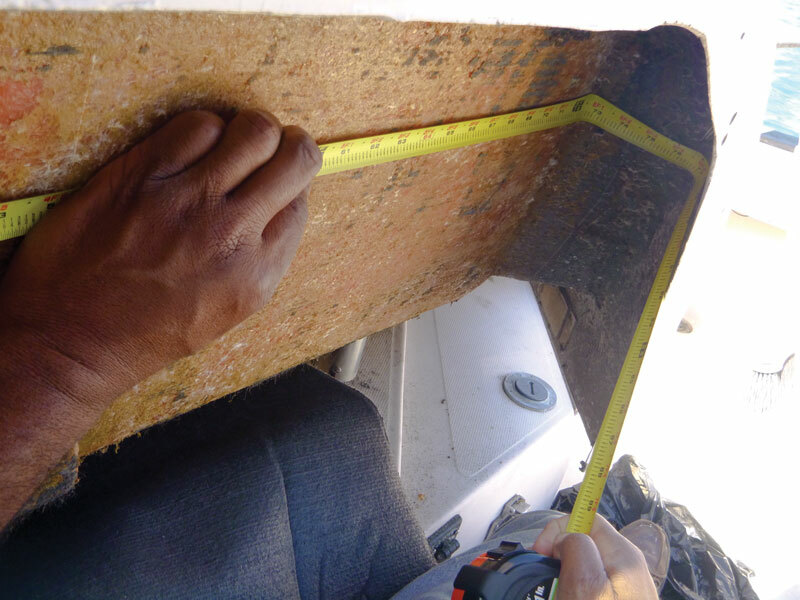 You also need to consider the weight of the carpet for your application. Since I was installing the carpet on the sidewalls of the deck, I made sure it was lightweight. I measured each sidewall and determined that I needed to start with two carpet pieces that measured 36 inches by 84 inches. My search for a good selection of marine carpet led me to Carpet Manufacturers Warehouse in Commerce, Calif., whose Carpet Guru, Jesus, said he had a variety of carpet specifically for boat applications. I actually found a remnant that matched my existing carpet and was the perfect size to make two carpet pieces. It cost me $19.82. To properly remove and install carpet, you want to have as much access to the area as possible. My port sidewall was unobstructed, but I did remove the pedestal helm seat next to the starboard sidewall. Any items you are not able to remove should be covered and protected, because old carpet generates a lot of dust and debris. You should wear protective eyewear and a facemask, and if you are working in the interior, open the windows and hatches to keep the area well ventilated. I was surprised the sidewall carpet had not fallen already, considering it had suffered three decades of exposure to salt water and sunlight. 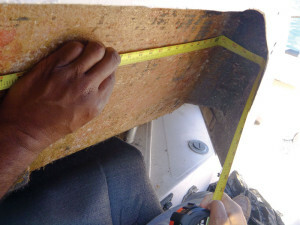 Both carpet pieces were easily removed intact with a firm pull (picture 1). You want to be sure all the old carpet material is removed before applying the adhesive. 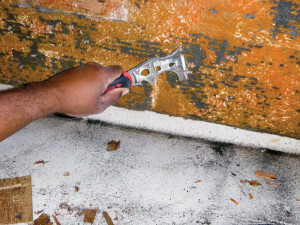 I used a metal scraper (picture 2), but you can use heavy-grit sandpaper. Once the carpet has been fully removed, wash the area with an environmentally friendly detergent and then wipe it with acetone. Be sure to use protective eyewear and chemically resistant gloves. Rinse the entire area with fresh water and allow it to dry completely. The sidewalls were mostly rectangular shaped, except the aft area, which was curved. I wanted to make sure I completely carpeted the sidewall and this curved area, so I measured the straight run of the sidewall and the curve (picture 3). For each sidewall, I used the old carpet as a template and lightly traced the actual size with a pencil to use as a reference (opposite page). Then I moved each piece of old carpet back seven inches to draw the actual aft border for each sidewall. I only had an orange marker in my toolbox, so I used it to mark the cutting line. Once the pattern for both walls was drawn on the new carpet, I used scissors to cut each one to size (picture 4). I used a plastic spreader to apply Redrum Fabrics carpet adhesive, $25.99/quart at West Marine, to the sidewalls. (Fans of “The Shining” will remember this name, which is murder spelled backward.) Be sure to apply a thin layer of adhesive; otherwise, it may leak through the backing onto the front side of the carpet. I covered one sidewall at a time with adhesive and gave it time to cure until it was slightly sticky. Then I started mounting each piece from the forward square end and slowly worked my way aft. I used another plastic spreader to gently press and remove any bubbles in the carpet or the adhesive. To complete the installation, I trimmed excess carpet from the curved area of the sidewall. You should give the mounted carpet 24 hours to cure (picture 5). 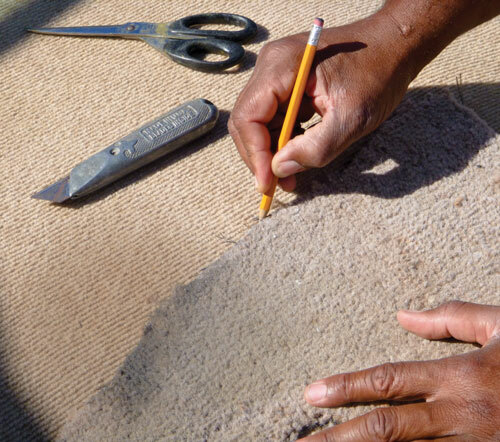 Although old carpet may have an interesting history, it can be a health hazard or just plain ugly. In the spirit of wise Latin philosophers, I say “Carpe Carpet Diem” — seize the day, to carpet! Unless, of course, you like the smell of cigarettes and cologne with your mildew.